When I say yoga has changed my life, it’s no exaggeration. Lessons that I learned from yoga can be applied in everyday situations. I was reminded of this yesterday. Graham and I planned to walk to a neighborhood Thai place for dinner. I was looking forward to pad Thai; I didn’t want anything else. But when we reached the door to the restaurant, we saw chairs stacked on top of tables and the sign was turned off. We had forgotten it’s closed on Mondays. I was instantly hangry. I didn’t want to walk just one more block to the sushi place Graham suggested next. Countless negative thoughts floated around in my head. 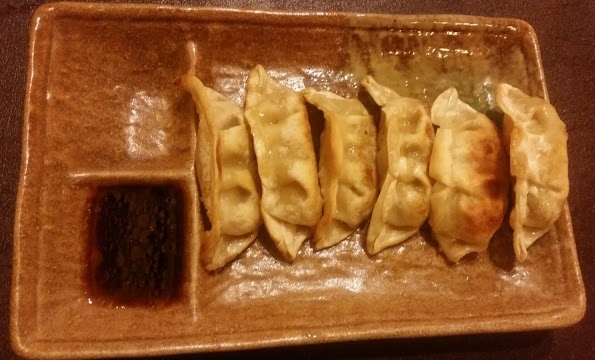 I still had a frown on my face as we walked into Asahi Roll on Sheridan in Rogers Park. I didn’t even want to sit in the restaurant; I wanted to take the food back home. I had an idea that the food wouldn’t be as delicious. On my first taste of yakisoba noodles, I realized how wrong I had been. 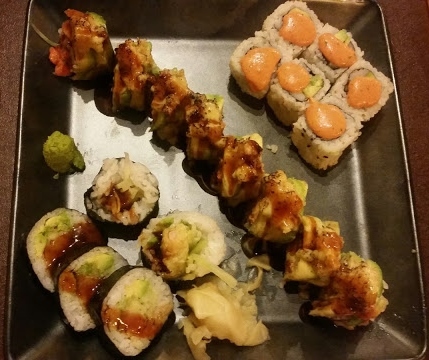 I sampled Graham’s sushi rolls: the Avocado Torch, spicy California and shrimp tempura. I couldn’t get enough, yet I hadn’t even wanted sushi! That spicy mayo elevated that California roll. The mix of spicy tuna, avocado, tempura crunch, eel sauce and spicy mayo on the Avocado Torch sealed the deal for me. I wondered why we hadn’t tried this place before. We devoured every bite of the meal. I couldn’t understand why the small, no frills location was not more packed. We must have been asked four times if everything was to our liking. Asahi Roll, we’re going to be friends. So what’s the lesson in all this? First, temper your hanger. Second, just go with the flow. Nothing is under control. When one plan is derailed, be open to the possibilities. It may lead you to the best sushi you’ve had in a while. Also, one of their rolls is the Arizona Summer, which seemed like a sign that I was meant to try this place. That’s next on my list of rolls to try along with the Loyola Roll.